Note: The OSHA Standard does not meet most local building codes. Following OSHA Standard strictly leaves you and your company with a liability should an accident occur. Check with your local building department for any changes that go above and beyond the OSHA Standard. "Application of requirements." 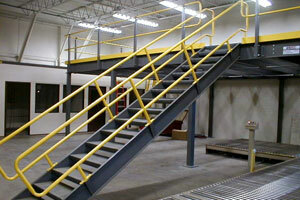 This section contains specifications for the safe design and construction of fixed general industrial stairs. This classification includes interior and exterior stairs around machinery, tanks, and other equipment, and stairs leading to or from floors, platforms, or pits. This section does not apply to stairs used for fire exit purposes, to construction operations to private residences, or to articulated stairs, such as may be installed on floating roof tanks or on dock facilities, the angle of which changes with the rise and fall of the base support. "Where fixed stairs are required." Fixed stairs shall be provided for access from one structure level to another where operations necessitate regular travel between levels, and for access to operating platforms at any equipment which requires attention routinely during operations. 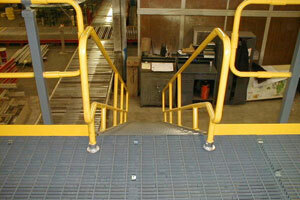 Fixed stairs shall also be provided where access to elevations is daily or at each shift for such purposes as gauging, inspection, regular maintenance, etc., where such work may expose employees to acids, caustics, gases, or other harmful substances, or for which purposes the carrying of tools or equipment by hand is normally required. (It is not the intent of this section to preclude the use of fixed ladders for access to elevated tanks, towers, and similar structures, overhead traveling cranes, etc., where the use of fixed ladders is common practice.) Spiral stairways shall not be permitted except for special limited usage and secondary access situations where it is not practical to provide a conventional stairway. Winding stairways may be installed on tanks and similar round structures where the diameter of the structure is not less than five (5) feet. "Stair strength." Fixed stairways shall be designed and constructed to carry a load of five times the normal live load anticipated but never of less strength than to carry safely a moving concentrated load of 1,000 pounds. "Stair width." Fixed stairways shall have a minimum width of 22 inches. "Angle of stairway rise." Fixed stairs shall be installed at angles to the horizontal of between 30 deg. and 50 deg. Any uniform combination of rise/tread dimensions may be used that will result in a stairway at an angle to the horizontal within the permissible range. Table D-1 gives rise/tread dimensions which will produce a stairway within the permissible range, stating the angle to the horizontal produced by each combination. However, the rise/tread combinations are not limited to those given in Table D-1. "Stair treads." All treads shall be reasonably slip-resistant and the nosings shall be of nonslip finish. Welded bar grating treads without nosings are acceptable providing the leading edge can be readily identified by personnel descending the stairway and provided the tread is serrated or is of definite nonslip design. Rise height and tread width shall be uniform throughout any flight of stairs including any foundation structure used as one or more treads of the stairs. "Stairway platforms." Stairway platforms shall be no less than the width of a stairway and a minimum of 30 inches in length measured in the direction of travel. "Railings and handrails." 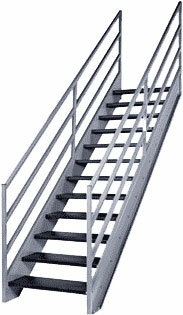 Standard railings shall be provided on the open sides of all exposed stairways and stair platforms. Handrails shall be provided on at least one side of closed stairways preferably on the right side descending. Stair railings and handrails shall be installed in accordance with the provisions of 1910.23. "Vertical clearance." Vertical clearance above any stair tread to an overhead obstruction shall be at least 7 feet measured from the leading edge of the tread. 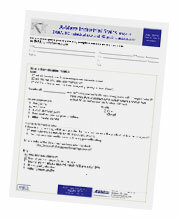 This information is copied from OSHA's website. A-Mezz Industrial Structures is not responsible for the accuracy of this information. This information is meant to serve as guide, not the authority of the OSHA standard.For additional OSHA clarification please visit OSHA's website at http://www.osha.gov. 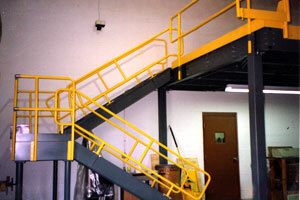 Click here for more information on our metal OSHA stairs.